Naga Sea Witch: Mana cost increased from (5) to (8). Call to Arms: Mana cost increased from (4) to (5). Possessed Lackey: Mana cost increased from (5) to (6). Dark Pact: Heal reduced from 8 to 4. Spiteful Summoner: Mana cost increased from (6) to (7). Crystal Core: Minions become 4/4 vs. 5/5 previously. As usual, there was a lot of speculation from the community of how the nerfs would impact the meta. Many suggested that Spiteful Summoner would still be viable despite the change, and that Odd Paladin would reign supreme. Let's take a brief look at how the meta evolved over the first 12 days since the changes were made. The image below shows the relative change in play-rate by archetype for the 12 days immediately before and after the nerfs. Only archetypes that saw >1% play before or after the nerfs are included. The following shows the logarithm of the above. 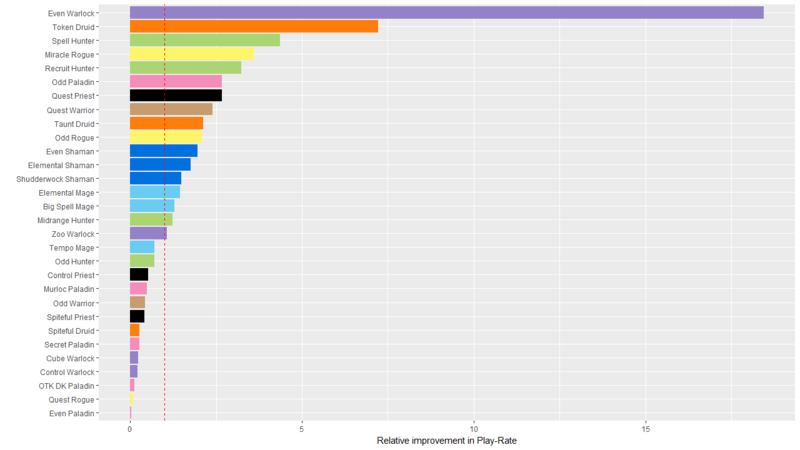 The logarithm provides another view of the relative improvement vs. reduction in play-rates by deck. A value of -1 implies a reduction of 10x in play-rate, whereas +1 implies a 10x increase in play-rate. Unsurprisingly, you can see from the plots that the big losers are those that were directly affected by the nerfs. Even Paladin and OTK DK Paladin in particular were affected the most even with only a single card changed. It just shows how powerful Call to Arms was before the nerf. Quest Rogue, which was directly impacted, has also taken a significant hit. Following are the Cubelock and Control Warlock archetypes, and then by Spiteful Druid and Spiteful Priest. As old archetypes go away new ones arise and take there place. The changes have led to greater diversity in the decks and classes that have a viable win rate . Players have gravitated away from slower warlock archetypes and taken up Even Warlock. Prior to the nerf, this deck was very niche, but now has the largest relative bump in play-rate. Druid players have moved back to the Token Druid archetype, which was heavily oppressed by cards like Voidlord. Hunter seems to be the biggest winner overall with Spell Hunter and Recruit Hunter variants seeing significantly more play. Interestingly, players are playing less Murloc Paladin . This archetype was widely predicted to rise up given its historical strength and the anticipated weakening of Even Paladin. Control Priest has also taken a hit due to the lower prevalence of its strongest matchups. Once again, Blizzard has shown us how much fun Hearthstone can be when balance changes are made, and a wide variety of decks become viable. The changes have certainly shaken things up and stale archetypes are seeing significantly less play.